The bathrooms are put through consistent wetting. This helps the producing of microogranisms, for which you have to use agressive chemicals to take them out. Combining of moisture and agressive chemicals impacts really bad on all construction products. Experiences have shown that the problems in the bathrooms are: leaking from critical points in the corners, consistent smell of mold, breaking on certain tiles and more. All those troubles can be avoided, if the bathrooms and the wet rooms are made with modern technology, including mandatory hydroisolation and durable glues. Benefit from the advatages of the technology for hydroisolating, to ensure peace for you and your neighbours under you. The hydroisolation eliminates the chance of leakage in the lower rooms and defends the concrete construction from moisture. 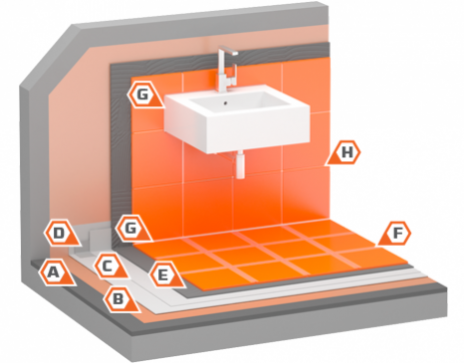 The applying of the tiles in the bathroom starts from the walls and finishes with the tiles on the floor. Every one of the used cement pastes, glues and grouts have to be waterproof or hydrophobic, the silicones and the sealants with increased protection of mold. Read carefuly the instruction for applying of every product. Their correct following is very important for the durability of their coverage. You must apply the tile adhesive not only on the foundation, but also on the back of the tile, because that way there are no cavities left under them, which could fill with water. Apply the hydroisolation not only on the floor of the bathroom, but also on the walls on the height of the wetting.